Do you have stone and/or marble decorative floors that need maintaining? This stone & marble floors cleaning package deal is a great starter package for your business. Included here is a rugged low speed 17 inch commercial floor buffer by Trusted Clean, matching pad driver, 2 cases of red scrubbing pads, 2 cases of white polishing pads, 3 microfiber carpet bonnets, a neutral pH stone floor cleaner, and a 4 gallon solution tank to conveniently dispense cleaner (or solution of any kind). And then we throw in a case of Rebound floor polishing cream for FREE! Please take a look at the table of products below for more information on all the items included in this package. With this package you'll be all set to start scrubbing and polishing your marble, terrazzo, granite, or slate floors. 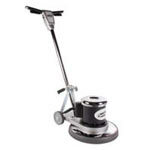 And after you're done with your stone floors you can use this versatile machine on other hard floor surfaces like commercial tile, and even do carpet scrubbing with a carpet bonnet. Also, check out our other floor buffer cleaning package deals for other floor surface types.